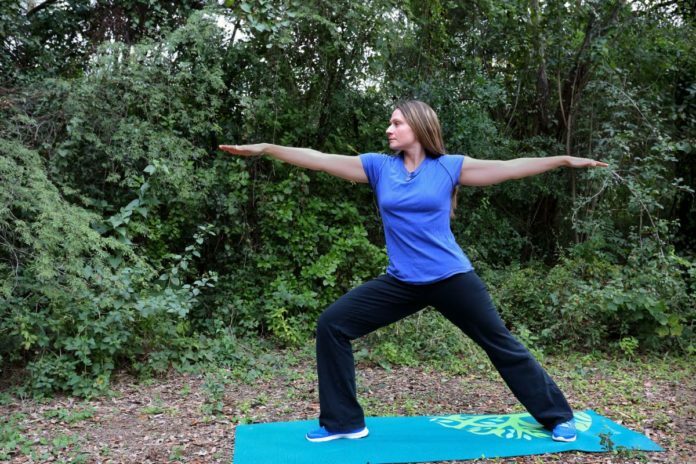 Sabrina Lartz is seen in a warrior pose. Lartz has started a workout series at Quinta Mazatlan combining yoga and interval training. For those craving a mind/body balance, Quinta Mazatlan hears you. Beginning February and until May, from 9 to 10 a.m. Thursday, the urban sanctuary will be offering “Healing in Nature,” a workout series combining yoga and interval training. Sabrina Lartz, who began working at Quinta Mazatlan last month, has created and will be instructing the course. Lartz possesses a degree in both wildlife management and ecology. She describes Quinta Mazatlan as, “the perfect place to work” as here she has found balance between her interests in nature, health and fitness. After moving to the Rio Grande Valley from Florida, Lartz began working at a fitness studio and within a matter of weeks began to develop her own, unique workouts and instruct classes herself. Lartz has taken training received from the fitness studio and incorporated those techniques into the program at Quinta Mazatlan. The program is designed for everyone and allows for modifications to be made as needed. According to Lartz, yoga is an especially great regime for those recovering from physical injuries, as it gets them back into a routine of exercise. The series will take place outdoors at the mansion’s Meditation Meadow. In having the class outside, alongside nature, people tend to feel more connected, she said. With admission to the park, participation in “Healing in Nature” is granted for free. The park encourages those interested to bring their own mat and dress in accordance with the weather.